Although you probably don’t look to Taco Bell for help getting into the holiday spirit, it looks like the giant Chalupa purveyor’s got you covered this year. On Wednesday, the chain unleashed a new holiday merchandise collection to spice up your winter wardrobe... and keep you cozy while you inhale a bag of late-night tacos. The line of products includes loungewear, ugly -- er, festive -- holiday sweaters, pajamas perfect for the T Bell connoisseur in your life, and more. All of the products are available now on the company’s online store, but they’re expected to sell out fast. Highlights from the collection include new Tipsy Elves sweaters, one of which has the establishment’s logo printed across the stomach surrounded by tiny tacos (talk about wearing your heart on your sleeve). The others are a bit more subdued, with a taco-decorated Christmas tree and Santa riding in his sleigh. 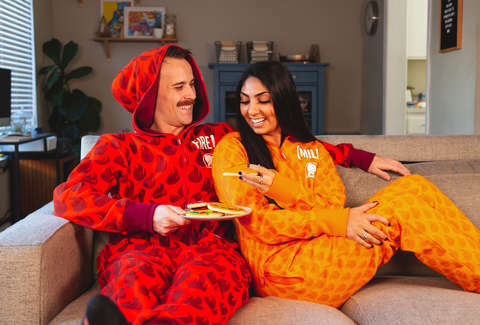 But if you’re in the market for something spicier, consider scooping up one of Taco Bell’s new holiday Fire Sauce and Mild Sauce onesies, which are designed to emulate the signature hot sauce packets you grab by the fistful with your taco order. This isn’t the first time Taco Bell’s tackled the holidays. The chain recently dished out a one-of-a-kind Thanksgiving collection that sold out faster than you can say “I love tacos.” It also has merchandise you can rock any time, though we wouldn’t hold it against you if you wanted to live in the new Christmas collection year-round. After all, what’s an outfit without gold hot sauce glasses? The only item the store is missing is a taco-themed bib.